My hubby and I just returned from a quick visit to Kentucky. It was nice to just get away for a bit and have a change of pace. Probably the favorite thing we did was take a dinner cruise on a riverboat. It was very nice and relaxing. I had scheduled a few postings to automatically upload while I was gone, but that was only through Wednesday. (So I was kind of sneaky - you didn't even know I was gone, did you?) 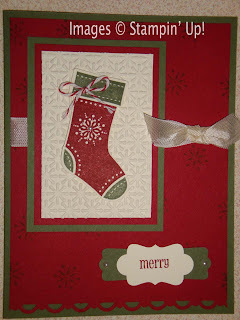 But I'm back and today I have some samples done with items from the current Holiday Mini Catalog. 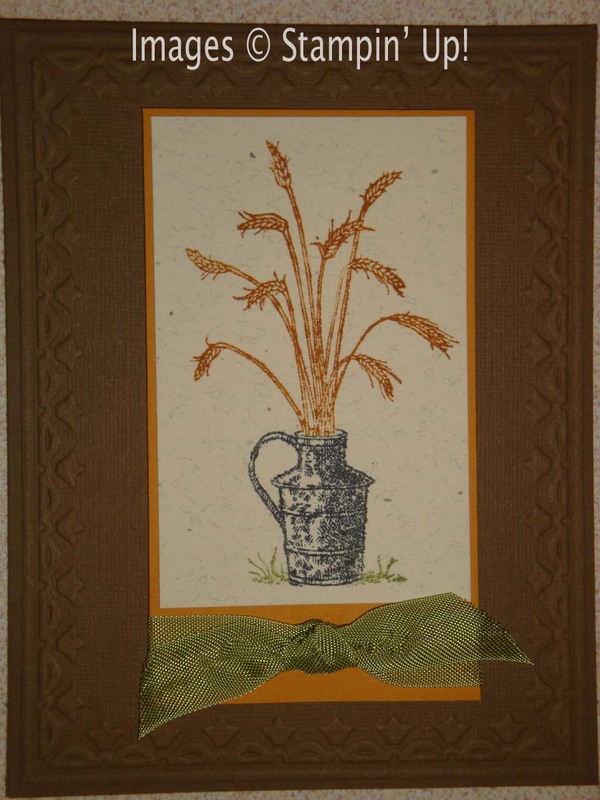 The first card was made by Debra Currier. She used the Always Thankful stamp set. She colored the rubber with markers before stamping. I love how tranquil this card looks. 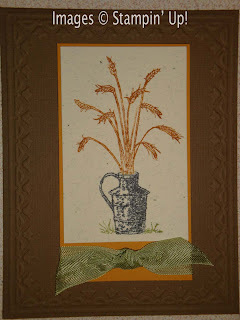 Deb's style is classic, simple stamping and her cards always look great. This next card was created by Judy DiScipio. The trees are from Scenic Season, which is in the Idea Book & Catalog (aren't they gorgeous?) but the little girl image is from Gift Givers, which is a new set in the Holiday Mini Catalog. This stamp set is so versatile! It has images for Halloween, Thanksgiving, Christmas/Winter, Valentine's Day, St. Patrick's Day, and Easter! Judy also added some shimmer with the Silver Glimmer Paper, Dazzling Details glitter glue (new! ), and some Basic Rhinestones. I love the colors and bling on this card! 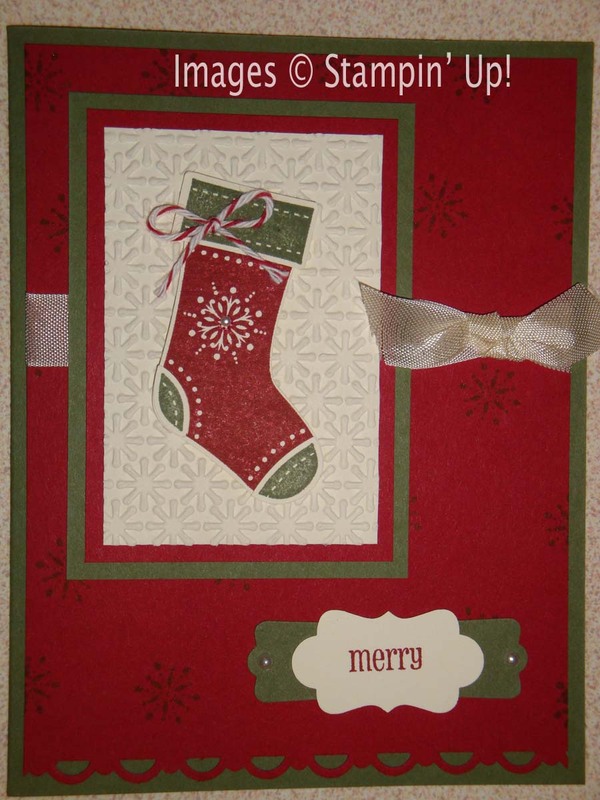 Lisa Gray made this adorable card with the Stitched Stockings set and coordinating Stocking Builder Punch. 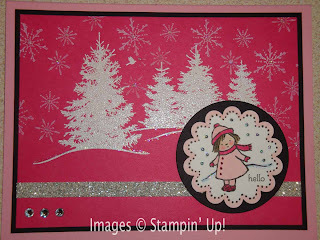 She also used the Snow Burst textured impressions embossing folder from the Holiday Mini plus various other items from the Idea Book & Catalog. I think this stamp set and punch are definitely two of my favorite items from the Holiday Mini Catalog. Well it's late (for me) and I'm tired because I've been transcribing ALL day. So I'm ready to go put my feet up and take it easy.